Ace was very busy that Saturday morning, as it is every Saturday morning. It is open upon just until noon on Saturdays. A lot of people think as well of them as I do, and it seemed like all of those people were there that morning, waiting in line with me. As I waited, I reflected on an important truth: the grass was probably going to continue to grow while they had my mower, and we are still in the once-a-week mowing season, even though the days are growing shorter and the rains have just begun to back off. What was I to do. 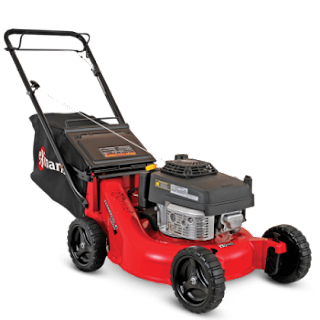 Before I left Ace, after having given them a deposit, I walked around their small showroom and looked at the tools, including new lawnmowers and other equipage of a well prepared gardener. They have really good stuff, because, clearly, a very large portion of their revenues must be from professionals. Those professionals would range from the mow, blow, and go guys so beloved in Miami Springs to the people who are hired to care for gardens as I would want mine cared for. As I was looking at the tools and equipment, I was wondering what I was going to do about cutting my lawn while my mower got its makeover. This is an Exmark, commercial walk behind. What particularly fascinated me was that while Exmark is a US manufacturer, the engine is a Honda GXV 150. Although the photo shows a red-body, the one I saw had a black body, which is cool, don't you think? It also has a huge grass-catching bag: 2.5 bushels. And the gas tank will take a full gallon of gas. As I went through the process of rationalizing a possible purchase of this wonder, my mind went to the big pick-up truck commercials that support the TV network broadcasts of fall football. A lot of guys must buy those things, as I mentioned to my friends at our weekly, all-male Starbucks session yesterday morning. I observed that if guys were buying those big new trucks in what must be incredible volume, then why would I not get the Exmark? One of my brothers at Starbucks observed that those big trucks are "girl magnets" that men purchase to lure young women into situations that would deny these men forever the opportunity to serve on the Supreme Court. I had never thought about those trucks being girl magnets, but suddenly a picture popped into my mind. It showed me cutting my grass with a brand-new Exmark, pursued by a throng of Miami Springs housewives. That picture was more disturbing than pleasant, which is I guess is what happens when one reaches age 72 and is not Senator Biden. In any event, I left Ace that prior Saturday morning without buying the Exmark. My plan was to ask my buddies from Starbucks if I could borrow one of their mowers to get me through. I brought it up yesterday during the discussion of pick-up trucks as girl-bait. One of the guys said his mower was a "piece of junk," that I wouldn't like it, and he was reluctant to offer it. One of the others offered his mower, but as he described it to me, it sounded very much like a piece of junk too. But he offered to bring the mower over, help me to get it started (because it was not easy to start), and maybe stick around, since it probably would not cut the whole yard without quitting at least once. He even offered to cut the grass for me with that mower himself, which I thought was very nice, but not satisfactory. So I went on line to see who rents lawn-mowers. I found, of course, that Home Depot rents all sorts of equipment, including lawn mowers. They had both a push-type power mower and a self-propelled, walk behind mower, similar in design to my Honda, but not a Honda, a Toro. I could rent the latter for $24 for four hours. Solution! Over I went to the HD in East Hialeah, near Okeechobee Road and the railroad track (the same railroad track by which once lived Johnnie-and-Mack, but that's another story.) An HD employee in the rental-equipment section and I lifted one of the self-propelled Toros down from a shelf. He pulled the starter rope, it cranked right up, and we had a deal. When I brought the mower home in our vintage 4Runner, Carol helped me lift it out and put it down on the driveway. (Thank you, Crossfit.) She took a close look at it. One of the most immediately disturbing things she noted was the grass-catcher. It was liberally sprinkled with what my mom used to call "stick-tights," those things that are actually weed pods (the kind of round ones) and spikey seeds (the thin pointed ones), representing the evolutionary struggle of the plant kingdom as it seeks to take over the surface of the earth in such an unruly way that the Lord was forced to create Man to help him deal with it in what one of the the Lord's friends described as a "garden" in the Book of Genesis. So, it took us about 10 minutes to pick these things off the grass-catcher, short-circuiting a clever plan to transform my yard into a weed-patch. Then it took about 20 pulls of the starter to get the thing started. Then, ominously and seriously disappointing, the self-propelled feature simply would not work. This was something I did not test at the HD. But rather than return it and start all over again, I decided to push it around the lawn. It cut pretty well - the blades were still sharp enough to cut the grass cleanly. There was at least that. But what an effort it took! I took several times-out in the process, but I got it done. During the mowing process, I usually let my mind range over a number of different topics. But this time, I focused on the letter I was going to write to Home Depot. I went through several articulate and hard-hitting drafts in my head about how Home Depot had rented me a piece of junk. When I took it back, I brought the problem to the attention of the HD equipment rental person who had helped me in the first place. He went to his manager about it. The manager came over, cranked up the machine, and then pulled the lever that was to propel it. It did not work, of course. I kept my cool. I told them calmly that I was disappointed. I perversely hoped that they would tell me that I could have brought it right back in, but since I didn't, well, tough luck. They would do nothing. What a great way to close my letter to the president of HD, with that sort of "customer service." Instead, the manager refunded me $20.75 of the $25 I had obligated myself to pay. He did so in a clever way. He went back and redid the deal, so that he showed that I obligated myself to pay him not just the $25 but also a $2.50 "Damage Protection" fee. Then he deducted $20.75 from the charge, and so my out of pocket was about $9.00. True, I didn't "damage" the unit, but it was so clever, that I cooled off and let it go. Back at the house, I sat and watched some football. When I got up, I felt what I usually feel after a good Crossfit session. Pushing around that mower as the bag filled up with cut grass, I had received quite a work-out. I notice that my heart-rate elevated during the mow appropriately. I got a $9 dollar training session - and a grass cut. It was all really very good. But the lawnmower was still a piece of junk. I saw no girls, except for Carol, and she was already hooked and well in the boat.